Theotokos Pammakaristos parecclesion mosaic, originally uploaded by saintpeg. Theotokos is a compound of two Greek words, θεός “God” and τόκος “parturition, childbirth.” Literally, this translates as “God-bearer” or “One who gave birth to God.” However, since many English-speaking Orthodox find this literal translation awkward; in liturgical use, “Theotokos” is often retained in Greek or translated as “Mother of God.” This last is not precisely synonymous, as it describes a family relationship but not necessarily physical childbearing. 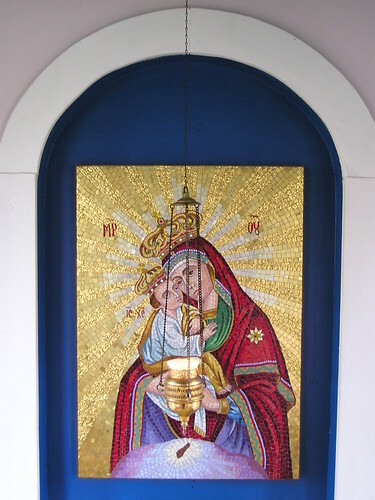 Furthermore, “Mother of God” (Greek Μήτηρ Θεού) has an established usage of its own in certain hymns, but especially on icons of the Theotokos, in which case it is usually abbreviated as ΜΡ ΘΥ. Theotokos, originally uploaded by phool 4 XC. The expression “Mother of God” or “Birth-giver of God” should not be understood in the eternal sense; that is, Mary is not understood as having eternally given birth to God the Son in the same way that he is eternally begotten by God the Father (see Holy Trinity and Nicene Creed). Rather, in the Incarnation, the divine person of God the Son took on a human nature in addition to his divine nature, and it is through Mary that this takes place. Since Jesus Christ is seen as both fully God and fully human, to call Mary the Birth-giver of God is to affirm the fullness of his Incarnation, and by extension, the salvation of humanity. Interior of St. Paul’s, originally uploaded by phool 4 XC. Many Fathers of the early Christian Church used the title Theotokos for Mary, at least since the third century AD. Often Origen (died 254) is cited as the earliest author to use the title Theotokos for Mary but the text upon which this assertion is based is not genuine (Socrates, Ecclesiastical History 7.32 citing Origen’s Commentary on Romans). Dionysios of Alexandria used the term in about 250, in an epistle to Paul of Samosata. Athanasius of Alexandria in 330, Gregory the Theologian in 370, John Chrysostom in 400, and Augustine all used the term Theotokos. Theodoret wrote in 436 that calling Virgin Mary Theotokos was an apostolic tradition. 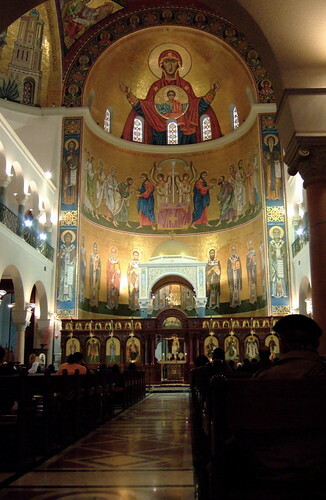 Mosaic of the Theotokos and saints, originally uploaded by asdamick. The use of Theotokos was formally affirmed at the Third Ecumenical Council held at Ephesus in 431. The competing view (advocated by Nestorius, then Patriarch of Constantinople) was that Mary should be called Christotokos, meaning “Mother of Christ,” to restrict her role to the mother of Christ’s humanity only and not his divine nature. 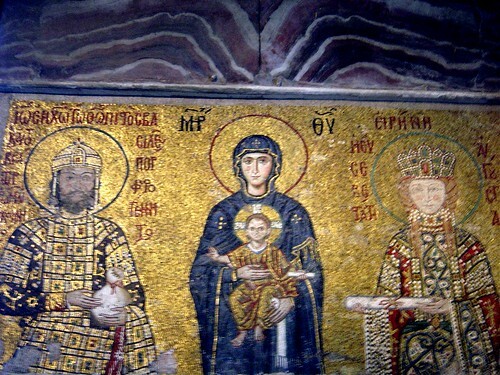 Mosaic of the Virgin and child, originally uploaded by Mernas. Nestorius’s opponents, led by Cyril of Alexandria, viewed this as dividing Jesus into two distinct persons, one who was Son of Mary, and another, the divine nature, who was not. Such a notion was unacceptable, since (in the Orthodox view) it sabotaged the fullness of the incarnation and, by extension, the salvation of humanity. Nestorius’s view was anathematised by the Council as heresy, (see Nestorianism), and the title “Theotokos” for Mary was affirmed. 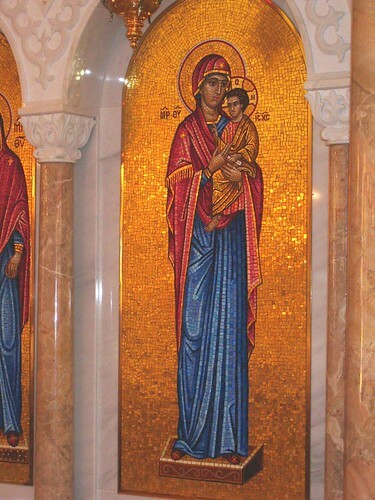 Theotokos Mosaic, originally uploaded by Aaroneous Monk. 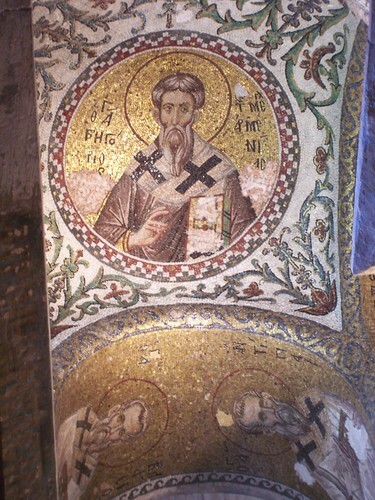 Mosaic, Hagia Sophia, originally uploaded by Lilbenne.